Poll: Old tricks, new treats or not into it? Memories of my youngest niece’s Halloween costume when she was 3 inspired guilt pangs this week. She was a Dalmatian. It was a stunningly simple project, once my sister-in-law moved heaven and earth to find plain white footed sleeper to hot glue black spots to. Alas, poor Little Guy is going to reenact last year’s performance of Thomas. Fortunately, the costume was way too big then. I did give him a chance to pick a new one at Target yesterday. His choice: Thomas. Big Guy had to have a new ensemble. 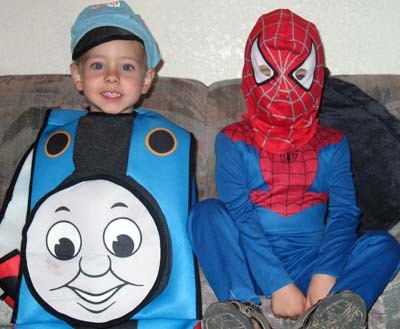 The SpiderMan he wore last year was almost too small at the time, but he wouldn’t go for a bigger size because the mask was attached. The good news: His Batman Dark Knight costume was marked down 25 percent, even though it’s still three weeks before Halloween. Retail panic, anyone? Still, I feel like I’m missing part of the fun of crafting something original and creative. I know the costumes I remember most fondly from my childhood were not the store-bought models — I used to hate sweating in those hard-plastic masks — but ones I conjured up on my own by rummaging closets and jewelry boxes. Maybe next year, when the guys are a little older and can start to get into it. What are your plans? Take the poll or leave comments. I love hearing other people’s ideas. They are adorable! I wouldn’t feel guilty about a thing if I were you! My son was a pirate most Halloweens because all I had to do was shred shirt and pants and apply make up(my own I might add). Every few years he would get a new sword. My girls were always princesses until the youngest finally realized that there was more to Halloween than dressing up like Cinderella. You are an awesome Mom and those youngun’s are gonna have fun trick or treating. Oh yeah. The fact they have costumes BEFORE the night before Halloween is a darn good sign they are going to grow up very sound of mind! It’s 50-50 at this point as to whether he actually wears it. I have two unworn Elmos in a closet that attest to his track record. I suppose, worse comes worst, he can wear the Batman cape and mask and his Superman pajamas. He walked around like that all last night and all this morning anyway.